CHICAGO (AP) The Chicago Bulls struggled for long stretches. They looked fatigued at times on the second night of back-to-back games. And they found a way to win anyway. 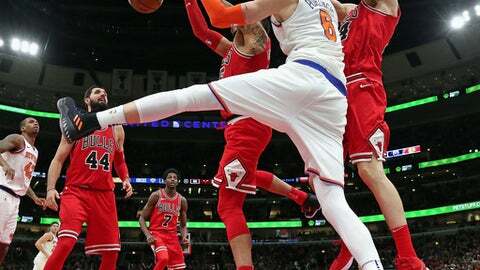 Kris Dunn scored 17 points, including two clutch free throws in the final seconds, and the surging Bulls rallied to beat the New York Knicks 92-87 on Wednesday. Chicago trailed by as many as 15 in the first half, but shut down New York down the stretch of its ninth win in 11 games. The Knicks managed just three points in the final 5 1/2 minutes. Lauri Markkanen scored 12 points for the Bulls (12-22), who were coming off a 115-106 win at Milwaukee. Justin Holiday and Robin Lopez had 11 points apiece. Kristaps Porzingis led the Knicks with 23 points, and Courtney Lee had 17. New York (17-17) has dropped three straight. Porzingis, guarded mostly by Markkanen, was shut out after he made a jumper with 6:58 left. The Knicks led for most of the night before Holiday hit a corner 3-pointer that tied it at 86 with 3:01 left. Neither team scored for the next two-plus minutes before Dunn found Markkanen ahead of the field for a dunk. New York’s Jarrett Jack was fouled with 8.5 seconds left and had a chance to tie it, but converted just 1 of 2 free throws. Dunn was fouled with 7.8 seconds to go and made both for a 90-87 lead. Following a timeout, Enes Kanter’s 3-point attempt missed badly and bounced out of bounds. Holiday then iced the game with a pair of free throws. The Bulls posted a 104-102 victory in the first meeting between the teams on Dec. 9 at the United Center, with Dunn hitting a pair of free throws with 2.9 seconds left. Chicago forward Nikola Mirotic was held to just four points. He averaged 18.5 points in the previous 10 games. New York rookie Frank Ntilikina has had Thursday night’s game at San Antonio circled since the schedule came out. It will be his first opportunity to meet countryman Tony Parker. ”He’s the best French player in history, so it’s going to be challenging to play against him,” Ntilikina said. Knicks: F Doug McDermott made his first start of the season and finished with three points in 37 minutes. F Lance Thomas had started 10 games with Tim Hardaway Jr. sidelined with a stress injury of the lower left leg. … C Joakim Noah was inactive for the second time in the last four games. The former Bull also was inactive for the Dec. 9 game. Knicks: Visit San Antonio on Thursday night. Bulls: Host Indiana on Friday night.